My Quilt Infatuation: Oh, the Fugliness of It All- a Giveaway! Oh, I would LOVE your first offering of the fat quarters. Thanks so much for the chance to win! I'd take the first bunch -- they would work nicely in a charity quilt. Thanks for the chance! I would love your FQ set. I make dolls and they would be great for doll dresses. Great giveaway!! Thanks. I think the fat quarters are awesome. I would love to have the fat quarters, I would put them to good use in a D9P or something else scrappy. Thanks for the chance. I am following via bloglovin. I would love the camo fabric. I am actually needing to make an outdoorsman quilt myself and it would be perfect! I really like the camo set. I am thinking I have a use for it on a quilt back. I really like the fugly material too. I follow your blog with Bloglovin. You make such WONDERFUL quilts! I love the fat quarters. Why does someone else's fabric look better. I could put the camouflage to good use too. My younger one would love that in something. Although I am in Canada, and won't be in the draw, I just wanted to leave a comment to let you know how much I enjoy following your blog, Kelly. Always a pleasure to see what you are up to! I follow through email and look forward to your posts above all others! I would love the chance to win the first fabrics. I think they are really gorgeous. Thank you for the giveaway. I am a new follower through Bloglovin. Since I have such a paltry fabric stash, I'd love a chance at the first set of fabrics! Thanks for the giveaway! How generous of you! I'd love a chance at the first set of fabrics! Oh, I love the fat quarters . . . well most of them anyway, lol. But, I would love the camo fabric! I got a little nephew that would love a quilt made with it! And, since the 31st is my birthday, I'll keep my fingers crossed!!!! Thanks for the chance to win! I AM already a follower!!!!!!! I didn't see any fugly fat quarters. I would love to win them. I also have some mossy oak camo that is left over from a baby quilt I made for a friend. I've been told that the baby's room is camo and Univ of Tenn. Sounds more like a man cave. I think your fugglies are just lovely! I'd love to sew with the first set. Thanks for the fun giveaway and for your inspiring blog! I follow your delightful blog via Bloglovin. Thanks again! One mans fugly is another mans fabulous..the first set is pretty. 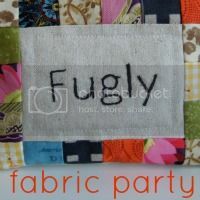 Fugly fabric - what fun! Would love the FQ's, the order you have them in really makes them look lovely. Lots of possibilities! Would love the camo fabric! I have a "would sleep in the wilderness, on a rock with nothing else, cause that's the only way to camp" son. I am certain I could use this fabric in a quilt for him. Thank you for the give-a-way! Hi Kelly...I follow you...who wouldn't? You know, I would use either set! Lemons always make great lemonade!! I'd love to win the set of 24 fat quarters. Thanks! What is fugly to one is someone else's treasure. I really like the first set of florals. The first bunch of fabrics would suit me just fine....thanks for the chance to win! I'd love the first set of fat quarters! I actually have one of those prints in my stash, and only have a tiny piece left of it. They would have a great home with me, and I'll take good care of them! Thanks for the giveaway! Hi, I would love to win the first offerings of fat quarters, thank you. I am following on BL. Would love the fat quarters! The fat quarters are fantastic! I really like the camo fabrics! Wow! How generous! I would prefer the camo fabrics. I am a happy follower! I could really use camo if it is that much to make our 8 year a pair of pants! So thats my choice he would love the three mixed together. OH I love the first set..I would make a stack and whack quilt with them! Great giveawawy. Thank you. Oh I love those fat quarters! Most of them are my colors! Although I really like some of those FQs in the first picture, I'd have to go for the Mossy Oak collection. I recently made a case for my husband's binoculars and have since had a couple of requests to have others done up before hunting season starts. This bundle would be perfect :) Thanks! I would love the first set! I love a challenge! I would love to win the fat quarters. Thanks for the chance to win. I`d love the fat quarters.Thanks! I'd love to win your colorful bundle -- these would be a great addition to the fabric that our guild uses for charity projects. I'd love to win the fat quarter bundle. I would use either stash...well, honestly, I would use the fq and my husband would use the camo! Thanks! I would love the first set. It would be a lot of fun figuring out how best to use them in future projects. Thanks! Id love either set! But the camo would be fun for the hunters in my house!